Cat Utopia is designed to accommodate a wide variety of needs. From single rooms to suites for cat families, this family-run cat boarding kennel provides personalized attention and gentle care in a safe and secure cats-only environment. The 1,100 square foot complex boasts 34 spacious, brightly lit rooms. 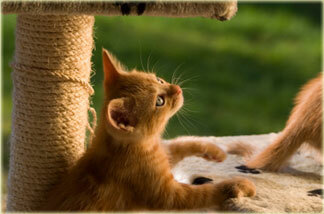 Each with natural light, in-floor heating, and individual air exchange, your cat will find all the comforts of home. There’s a fireplace to curl up next to plus virtual aquariums and on-site bird feeders for entertainment. 34 bright spacious rooms, each with a window, sun-drenched ledge, plush cat bed, climbing post and litter box ensure your cat’s comfort and relaxation. In-floor heating and individual air exchange provides a healthy environment. The facility, located adjacent to the main residence, is a secured premises — alarmed and monitored. Private outside runs are available if desired. Guests also have individual access to the common areas for stimulating playtime or curling up next to the fireplace.